Buying a fine, used saddle online can be an economical and convenient alternative to your local saddle rep or tack store, particularly for those on a budget or who live outside of a major metropolitan area. However, it can be an incredibly overwhelming and daunting experience, with literally thousands of saddles available with a quick Google search. But, you say, shouldn’t the saddle fit the horse? Absolutely it should but it does no good if you, the rider, are constantly fighting the saddle as you ride because the saddle doesn’t fit you! So let’s start with rider fit! 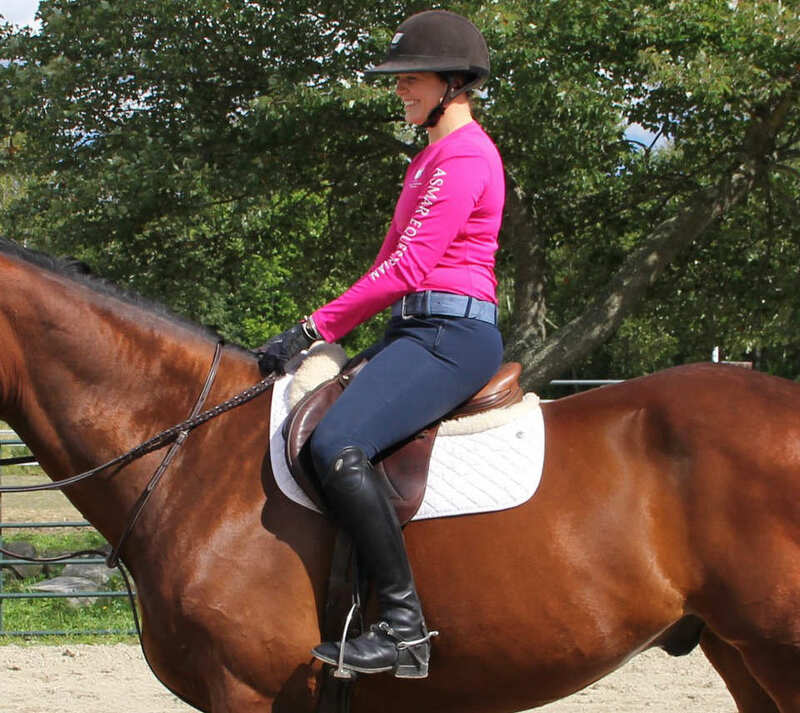 Knowing your saddle size requires three things: i) understanding how a saddle should fit the rider, ii) being realistic about your shape (after all, we are not all the same size we were as a junior), and iii) matching that information to an online saddle. I’m going to give you a strategy to find and buy the right size. 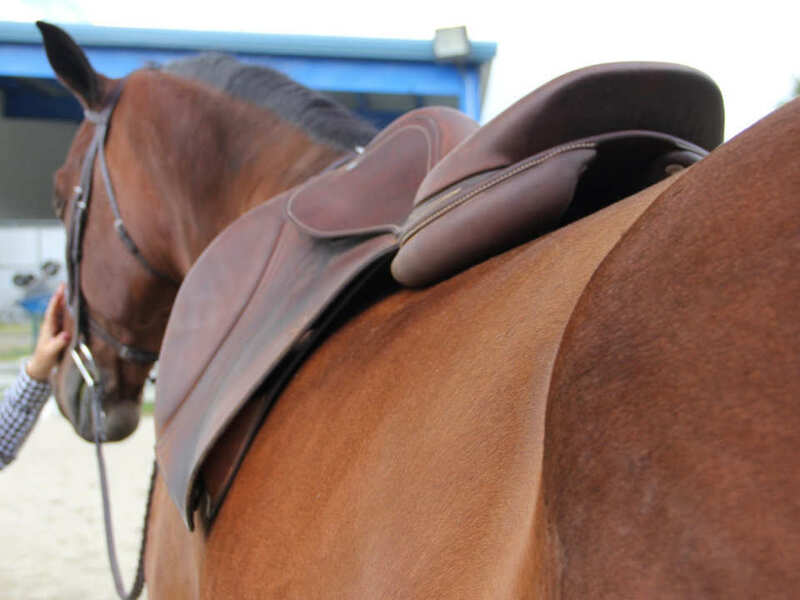 A properly fitted saddle should give the rider 3 to 4 fingers width between the back of the rider’s seat and the cantle. 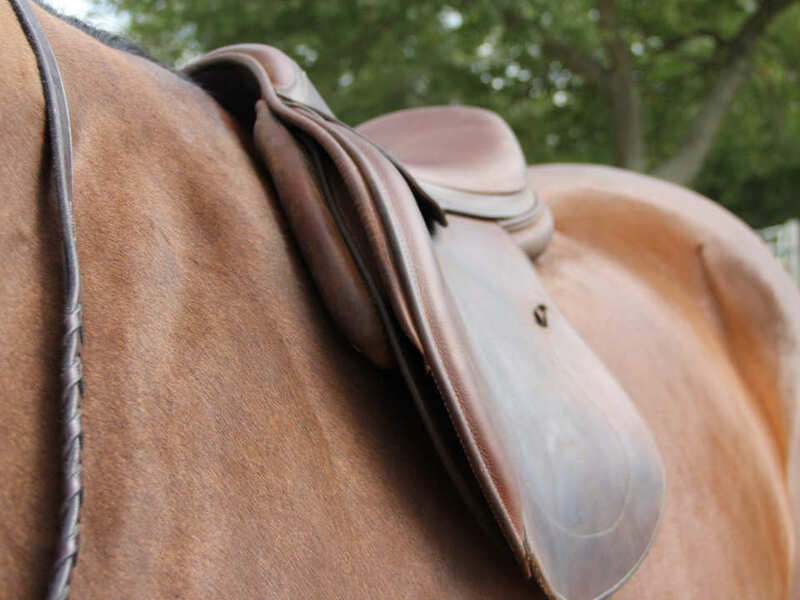 The bottom of the flap should end at the widest part of the calf, or about a third of the way down the rider’s leg. The knee should be entirely on the knee roll and there should be some knee roll showing in front of the knee. Try borrowing some saddles and find one that fits – the brand doesn’t matter. (If you are lucky enough to find one you love, that fits, take a picture of the saddle stamp). Good used saddle sellers will list the seat size, flap length and flap width for each saddle. Now you are going to measure! Find the seat size by measuring from the button on the skirt to the center of the cantle. Find the flap length by measuring from the stirrup bar where the stirrup leather lays to the bottom of the flap. Find the flap width by measuring left to right across the widest part of the flap. Now you have your seat and flap size and forwardness (or shape) and can start playing the matching game! Good used saddle sellers will list the seat size, flap length and flap width for each saddle. Knowing your horse means you can accurately describe his back shape and then be able to match that to a saddle that has appropriate paneling. Unless you have an exceptionally narrow or wide horse don’t get hung up on tree width – 95% of French saddles are built on a medium wide tree. What you need to do is think “Jello”. 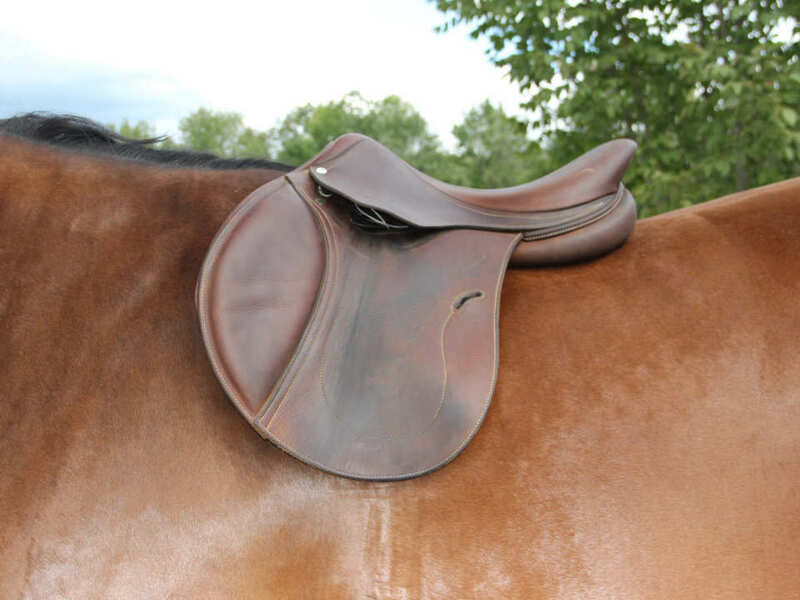 Your horse’s back is the Jello mold and the saddle paneling is the Jello. You want your Jello to evenly contact all parts of the mold and have a nice a level top. Look at the area behind the shoulder – is it smoothy concave, or a big depression, or no dip at all? You want the paneling under your tree points to mirror your horse’s shape. Is your horse overall level from wither to croup? Or is his back flat and lower than his wither? If so, you may need thicker paneling in the rear of your saddle. Take a picture of his back from the side, a three quarter view, and a rear view. Once you’ve identified saddles that fit you, don’t be afraid to send photos and ask for help in selecting the appropriate paneling. Sometimes you can just eyeball it but understanding the stamp is a huge help and your saddle seller should be able to help you interpret the stamp. Knowing your budget may be the trickiest part. Saddle pricing is driven by brand, age, condition, features, and color. All the French brands are roughly similar in price when new and options such as full calf or buffalo add on to the price. Grain leather is more durable, so an older grain saddle may be your most economical option. A well-maintained grain saddle will be comfortable, durable and have many years left at a lesser price. Saddles in the less popular caramel color can be had at a real bargain! Conversely, much like a new car, once a new saddle has been ‘driven off the lot’ you can expect to pay about 25% to 30% less. You may be able to make an offer, but don’t expect to get a huge discount. Armed with this information, you are ready to set forth into the world of previously enjoyed French saddles. Expect to be able to take a saddle on trial, but plan ahead so you will be able to ride in the saddle and take a lesson with your trainer during the trial period. One final piece of advice: Communicate with the saddle seller. 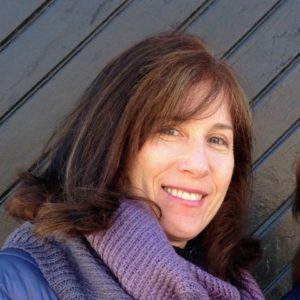 Don’t be afraid to email or call the online stores with questions.